Water-drinking tip 1: Start your day with a glass of water for a simple energy boost that fixes any dehydration from overnight. Keep a filled glass or bottle on your nightstand or next to the bathroom sink. 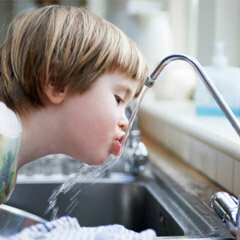 Water-drinking tip 2: The “best” amount of water for you depends on factors such as age, activity level, health level, medications you’re taking, and the weather. How do you know if you’re drinking enough? Follow your thirst, and know that you’re on the right track if you have straw-coloured urine. Water-drinking tip 3: For variety’s sake, try flavouring your water. Drop fruit into a pitcher and let it sit a few minutes — lemons, oranges, watermelon, and berries all work well. Let an herbal or flavoured green tea bag steep in unheated water to accent the taste. Water-drinking tip 4: Water is important when you travel. Most commercial planes fly at elevations between 30,000 and 35,000 feet where humidity is ten per cent or less. That means you’re breathing dry air in a tight space filled with germs from dozens of people. Water keeps your mucus membranes moist – and your defences high – even in that challenging situation.Bring an empty water bottle with you to the airport that you can fill for free once you’re past security. Or buy the biggest bottle you can right before you board, and aim to finish it by flight’s end. Don’t hesitate to ask the flight attendant for refills while you’re in the air.Water-drinking tip: Start by swapping out one soda, cup of coffee, or high-calorie hot chocolate a day with an equal amount of water. Carry a bottle of water with you all day long as a visual reminder to pause and sip. Sip more when you’re physically active, whether in water, snow, or any weather condition.